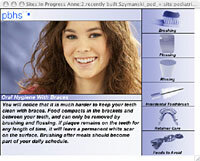 Your new appliance may make your teeth sore for a day or two, especially after an adjustment. If you have a sore spot on your gums call our office at 510-487-6784 so that we can adjust the appliance. Crowding is the lack of space for all the teeth to fit normally within the jaws. The teeth may be twisted or displaced. Crowding occurs when there is disharmony in the tooth to jaw size relationship or when the teeth are larger than the available space.